The best gaming projector is the one that works well for your gaming setup and best fits your needs. If you are thinking about purchasing a gaming projector to make your games larger than life, then there is a lot you need to know before you select one. Gaming projectors come in a variety of shapes and sizes and range in price based on a myriad of factors. Projectors are a fantastic alternative to dropping a large amount of money on a massive gaming monitor that you will have to mount, adjust, and hookup before you get to enjoy it. The gaming projector you decide on should be exactly what you are looking for to deliver a great gaming experience. If you are unsure about what you need in a gaming projector, that’s okay because we are here to help. We will tell you about what you need to consider when you are shopping for your new gaming projector. We will also tell you about some of our favorite gaming projectors, answer any questions you may have, and tell you about our favorite accessories that you will need to enjoy your gaming projector to the fullest. We know that sounds like a lot and you may be way more confused now than you were originally but don’t worry! By the end of our reviews, there is a good chance you will have found the gaming projector that completely fits your needs. If you can’t find a projector you like within our recommendations, that is okay too because you are guaranteed to know what you must consider when shopping around for your new gaming projector. By sharing our experiences with many gaming projectors, we know you will be more prepared to make your next big gaming purchase and are sure you’ll be satisfied with your choice. Gaming projectors just like most other items for gaming are a costly investment but they do come in an extremely vast range of prices. Certain gaming projectors without the frills will start at around two-hundred dollars but maxed out entertainment centers that you can game on can run up to twenty-four thousand dollars! In our opinion it is more important to get the best gaming projector you can afford without blowing your budget for accessories you may need. 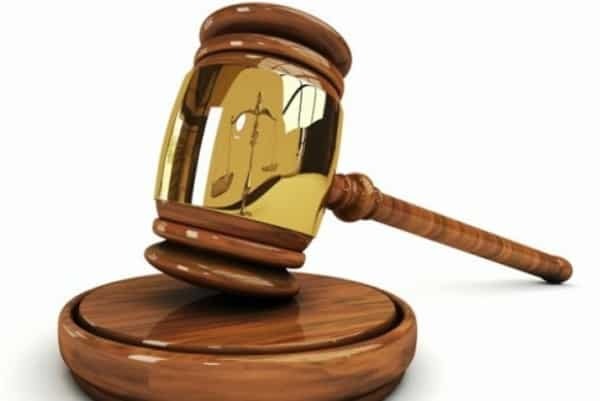 Don’t go into purchasing your gaming projector without considering the additional items you will have to purchase in conjunction with it because that will eat up your budget as well. Screens, 3D glasses, and projector stands are just a few of the items that you may need or want to purchase to better enjoy your new gaming projector. There is a lot to consider when picking out your projector but each factor from brightness to resolution will drive costs, so you need to decide what parts of the projector’s display are most important to you and what you’re most willing to spend on. You have probably used projectors before if you ever had to give presentations at work or school but your needs in a gaming projector are far different than that. You cannot always darken your surroundings to improve the image so good resolution is essential for gaming. While most projectors you’ve used at work are VGA or XGA projectors those will not provide you with the resolution needed while gaming. 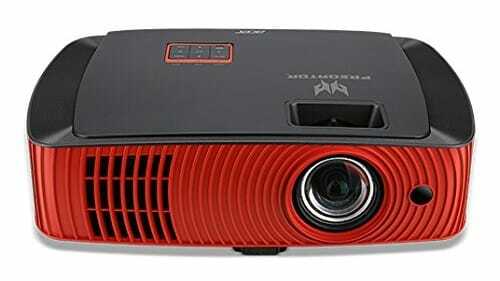 You will want a 1080P HD projector for gaming which are widely available in stores and online. 4K projectors are also a phenomenal choice but they tend to be more expensive than 1080P HD varieties. If you are willing to spend extra on 4K resolution we say go for it because you will enjoy fantastic image quality. While brightness isn’t the most important factor when picking out your gaming projector you will want to make sure that you are able to dim your surroundings if you are purchasing a gaming projector that has fewer lumens. Lumens are the measure of brightness that will determine how well your gaming projector’s display shows in areas with moderate to low light pollution. If your gaming room is unfortunately difficult to dim you may want to allocate more of your budget to a projector with a higher number of lumens. If you are playing in a well-lit room consistently 1000 to 2000 should be enough to keep the display from being compromised. Occasionally, an increase in brightness can cause a decrease in the time your projector lamp but we have seen this vary frequently. What good is a new gaming projector if you take it out of the box, go to place it on the shelf or stand and it doesn’t fit? If this happens you have to go purchase a new stand or shelf and it scoops more out of your budget and gaming time. We recommend you decide where you are putting the projector before you purchase one. Measure out the dimensions of the space you have for it and then decide which one you want. If you are doing your shopping online at Amazon, then you may be able to filter your results by the dimensions you are looking for. Weight is also a factor to consider especially if you are placing it high up or on a shelf with a weight limit, the last thing you would want is your mount to collapse and destroy your new gaming projector. You will want to check out the throw ratio listed on the information for the projector to ensure you can get your desired screen size without compromising how far you must mount the projector from the display. Throw ratio is screen size width over distance between projector and screen but we will go into more detail about why this is an essential later on. The higher contrast ratio you can buy the better when it comes to a new gaming projector. While it won’t drastically impair the quality of your gaming experience, a larger contrast ratio will give you images with greater depth especially in darker scenes. This isn’t a factor we recommend allocating the majority of your budget to since it won’t make a major difference in your image quality. If you do play in well-lit areas, you will want to figure out how to keep your deep blacks by dimming the surroundings or pushing for a higher contrast ratio. When you are browsing for a new gaming projector a good benchmark for contrast ratio is around 15000:1 to provide you with a gaming experience that has deep blacks and depth. Assuming you have a gaming monitor then we are certain you know what refresh rates are and why they are important. If not that’s okay, refresh rates are essential to provide you a buttery smooth gaming experience. How many times your screen is refreshed per second is your refresh rate and a higher refresh rate gives you a better experience with seamless game play free from choppiness even when playing games that are intense on the graphics. The refresh rates your gaming projector needs varies based on who you ask, we prefer 120Hz but also acknowledge that 60Hz gets the job done and doesn’t cut corners. We combined refresh rates and response time in the same category because they both are important to your overall gaming experience. The response time for gaming monitors are typically much faster than the response times for gaming projectors. You will want the lowest response time possible, but you may have to do a fair amount of searching to find the response times of a gaming projector. Higher response times can result in motion artifacts and image blurring when graphics intensive games with frequent camera movement. While it will cost more to ensure you get the best refresh rates and response time it can make the gaming experience your projector delivers better. Now we have reviewed a couple of the factors you need to take into consideration before settling on your gaming projector purchase. Depending on how familiar you are with gaming projector brands, other features, and if you know the different things you want to do with this device you may feel ready to pick out your projector now. If you’re still indecisive or want more specific information a variety of projectors you are in luck. We hope that by providing you with honest and specific reviews about each projector we tested you will be able to find one on our list that is just what you are looking for. If you can’t find a projector on our list to your liking, then we almost guarantee that our findings will put you closer to the one you are searching for. The Epson Home Cinema Home theatre projector is a top of the line home projector that delivers the ultimate entertainment experience whether you use it for movies or gaming. This projector features 4K enhancement technology that is compatible with 4K Ultra-High Definitions content and successfully upgrades non-4K content to have the same flawless appearance. The 3-chip 3 LCD design has an Ultra-Wide color range that allows all video to look stunning. The 2,500-lumen display has equal color and white brightness. This superior display extends past colors and whites with an ultra-black contrast ratio of 1,000,000:1. Even when operating in 3D mode resolution is Full High Definition. All this power is packed into a projector weighing less than twenty-five pounds. We had the blinds open in living room when we were testing out this gaming projector and we saw almost no decrease in quality of the image while gaming with the blinds open, even in dark scenes. We saw no noticeable lag when we were gaming with this projector even though we played a variety of different games including first-person shooter games with frequent camera shifts. If you do notice any lag, we had one person say they saw some but most of us didn’t notice, you can adjust your settings to ensure a lag-free experience. This screen is massive, our display reached 130-inches all the way across. We enjoyed this projector the most when we mounted it up on the ceiling because of the immense display but it will work just fine if you set it up on a stand. Then fan sounds nonexistent on this projector, even when standing under it and standing beside it before we mounted it on the ceiling we could hardly hear a thing. It was almost impossible for us to come up with drawbacks for this projector because it had pretty much none. We know that sounds too good to be true especially after you have read some critical reviews online but the only cautionary tale we have is to ensure the seller you’re buying from is reputable because a friend of ours who bought this projector had it die on him after two months. Another con worth mentioning is the price kind of. While we think this projector is worth every penny it is a steep price to pay for a projector and you may not have room for the additional accessories you’ll want with this item. This projector is an enduring gaming investment that we think you will never regret. 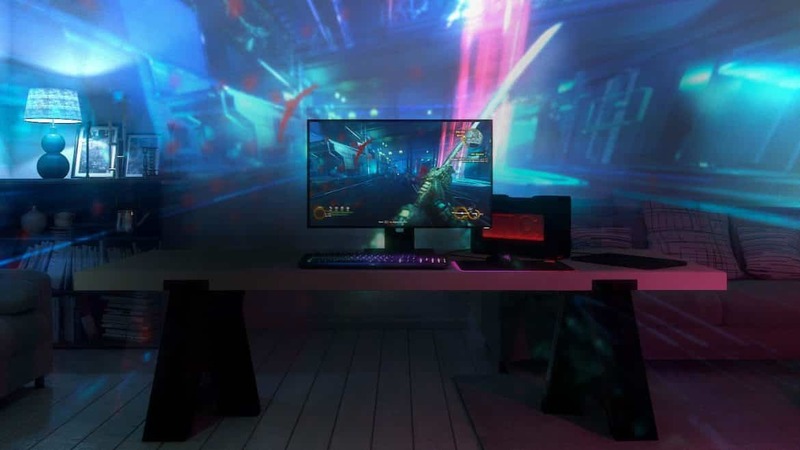 The 4K-display is better than many of the gaming monitors we have tried, and the display does not lose quality even in a lit room with both natural and artificial light. Sure, when you move from gaming on a monitor with a 1ms response time you may notice a decrease in responsiveness but most of us saw no lag and no motion artifacts even though we are used to quality gaming. This is by all means a pricey investment, but you get what you pay for and with this gaming projector you will have an immersive gaming experience every time you use it for years to come. The Optoma GT1080Darbee Gaming Projector delivers top-quality with a mid-range price for gaming projectors. The Optoma Gt1080Darbee projector displays video in Full HD 1080p resolution to provide vibrant colors. With 3000 lumens and a 28,000:1 contrast ratio you will have clear video with stunning colors ideal for gaming. A special feature that makes this projector ideal for gaming is the enhanced gaming mode with a swift 16ms response time to prevent motion artifacts. An energy efficient lamp will power this projector for up to 8000 hours before requiring any maintenance. This projector supports all HDMI 3D formats from Blu-ray to gaming. If this projector is four feet away from the screen it will still provide you with a 100-inch display. If space is an issue for you then you should purchase this projector for all your gaming needs. We had to put the .49 throw ratio to the test since it seemed far too good to be true, but it performed just as advertised. You can easily enlarge the screen size by increasing the distance between your screen and the projector without sacrificing quality of the image. The variety of modes tailored to specific activities set this gaming projector away from others, our favorite being the gaming mode with its rapid response times. The Darbee enhancement provides crisp and colorful images that can compete with some 4K displays we have tested out. The cooling fan was extraordinarily quiet and even though we kept it on the shelf nearby us we didn’t hear a sound when gaming. This projector does get pretty hot even with the built-in cooling fan, so we recommend you place it in an area that has constant airflow. We did notice some flickering in Eco-mode when our game was rapidly shifting between dark and light scenes but when we tweaked the settings that issue completely disappeared. While you can make the display larger without decreasing quality too much we don’t recommend doing that for gaming because you will lose some details that may be important when playing certain games. We also had a really difficult time when trying to mount this from the ceiling and eventually we just gave up and put it on our monitor stand. While we did find a few imperfections when using our Optoma Gt1080Darbee Gaming Projector its masterful gaming performance and crisp display when properly set up made it the best for gaming of its price range. While you may feel scared about this purchase based on a few less than satisfactory reviews online don’t be! We put this gaming projector to the test with Madden, Battlefield, and a bunch of other games. The gaming mode makes the response time swift enough to avoid all motion artifacts and lag completely. If you are looking for a short-throw gaming projector with 3D capability and superior display while keeping room for accessories in your budget, then we think that this is the perfect projector for you! The BenQ Video Projector is an outstanding projector you can use for gaming without breaking the bank. This projector has a bright 3,300-lumen display that increases picture quality with vibrant colors even in a well-lit room. DLP technology and an all-glass optical lens is paired with a 15,000:1 contrast which provides clarity and sharp display that is great for gaming, movies, and presentations alike. This projector is not short on connection and provides enough ports for multiple connections without having to use an additional adaptor. Whether you choose to use this projector for movies, casual gaming, or presentations you are guaranteed to enjoy the crisp and vibrant widescreen with WXGA1280 x 800 resolution. This diverse projector comes with built in speakers and added features to make it the best for a bargain price. For its bottom line price, the BenQ Video Projector does an amazing job at providing beautiful and crisp display while being mindful of your budget. We were gaming with a crisp 103-inch display in a dark room with absolutely no light bleed. You can scoot this projector further back to increase the display size while seeing only a minor decrease in crispness, not enough to negatively impact our game play. Even when we turned the lights on the slight reduction in image quality did not disrupt our gaming. This fan does not make a lot of noise and if you have any sound on you won’t be able to hear the fan at all. While this is not 1080p we think it competes beautifully with other projectors that are and find it just as gamer friendly as some of the other projectors on our list. As we said above you cannot hear the cooling fans on this projector, but they could be a lot better at cooling the projector down because it gets extraordinarily hot. We did have issues with a defective lamp the first time we ordered this projector, but we refuse to place too much weight on this con because there is a good possibility that damage occurred to it during shipping since our box arrived bruised and battered. If you are looking for a projector solely for text presentation purposes, then this may not be the right projector for you because we wish this display had a bit more clarity even though it doesn’t impact gaming. The BenQ Video Projector is the best value projector that can provide you with an immersive experience that is great for movies and gaming alike. Lag time is pretty much nonexistent even when you are playing first-person shooter games with jerky, frequent camera shifts. If you are trying to save money on your projector to allow room in your budget to purchase the accessories you desire, then this projector is the perfect one for you. Where other projectors in its [rice range can only be used for presentations and lag too much for games that is not the case with the BenQ Video Projector to our delight. The Epson Home Cinema Home Theater Projector has a screen display up to 90-inches from eight feet away and 134-inches from twelve feet away. 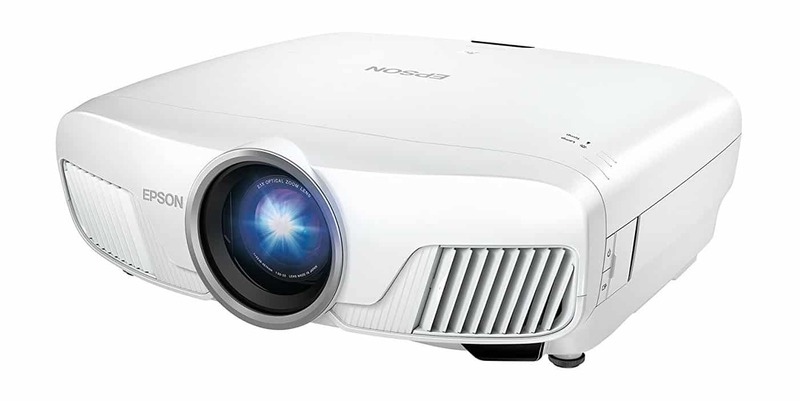 This projector has a bright display of 2200-lumens and a sharp contrast ratio of 35,000:1. The Epson Home Cinema Projector is not short on connections with an HDMI port, an HDMI/MHL port, one RCA composite, two RCA audio stereo inputs, one VGA port, and one USB type A port. This Full-High Definition display can stretch up to 300-inches on most flat surfaces. The 3LCD technology ensures true colors are apparent with this display from all angles and frame interpolation with image enhancement keeps all images smooth and crisp. A speaker is built-in to this projector to allow for the full gaming experience right out of the box. This 1080p image looks amazing and even when it is projected to its fullest extent it remains crisp enough to where our gaming is not negatively impacted. Even when we were sitting a good ten feet away from the screen and playing Witcher 3 we could see everything going on without any loss of quality. The quality you get with this projector is comparable to some of its pricier competition and the dynamic picture setting makes the color superior. Surprisingly enough even with some light coming in through the windows we could still appreciate the amazing color quality and sharpness of this display. This fan is crazy loud from the time you turn it on to when you shut it off which means if you aren’t mounting it from the ceiling then you are going to heart it unless the audio of your game is loud. The blacks aren’t deep enough for us, they appear to be washed out and in darker scenes the display seriously lacks definition. The throw distance wasn’t short enough for us to use in a large office room so if that is a deal breaker for you then its something you need to consider. There was occasional pixilation of images during first person shooter games during rapid camera shifts, but this wasn’t frequent. The speaker is crackly and isn’t very good even though it is loud. The creative frame interpolation is a double-edged sword and during gaming it did cause occasional stuttering. This projector is truly one of the best bang-for-your-buck projectors that we tried. While it had some drawbacks to it the positive assets of it far outweighed the issues we had with it. If you make sure that you mount this projector from the ceiling you will be out of earshot of the loud fan as long as you have audio on. While some of the features worked well for movies like the frame interpolation it did not work well for movies. If we hadn’t experienced stuttering and the poor depth of blacks, there is a good chance this projector could have been in our top three. If you aren’t overly picky like we are then you will appreciate the quality display and fantastic gaming abilities this projector has. The ViewSonic PRO7827HD Home Theatre Projector provides an immersive full high definition experience with a screen up to 300-inches. The 1920 x 1080 native resolution and 2,200 lumen display provides you with sharp and bright display that is sure to please during a variety of games and every type of movie. The full RGBRGB color wheel ensures that all colors are true to life without becoming unbalanced even when switching from animated games and documentaries with the press of a button. Like other ViewSonic projectors it has built-in 10-watt speakers to immerse you in the gaming experience you have dreamt of without the need for bulky external speakers or a hot gaming headset. 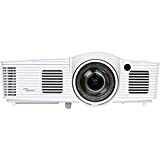 You can setup this projector to your liking with 1.3x optical zoom, horizontal and vertical keystone, four-corner adjustment, and vertical lens-shift. This projector includes an exclusive PortAll feature that allows you to steam multimedia content wirelessly. Even in brightly lit rooms with natural or artificial light this gaming projector’s display stays fantastically bright and vibrant which places it far above many of its competitors. Even the deep blacks stay true to their color when exposed to light with minimal decrease in performance. The lens shift performs well leaving us responsible for only minor adjustments. This projector has numerous versatile connections one VGA, one A/V, and three HDMIs allowing it to perform in a bunch of diverse ways. It’s compatibility with a bunch of other devices makes it a premium entertainment station that delivers a lot of different entertainment options. ViewSonic really delivers on some fronts and tends to have a few issues much like other projectors we tried out but the issues we had with this one made it quite the anomaly, we think we may be cursed but the cons are worth mentioning anyway. Unlike another ViewSonic we tried this projector keeps its cool, but the fans are so loud you can hear it over the audio. Speaking of the audio we think both speakers only work sometimes, and they sound tinny at best. We experienced a bunch of random errors and plenty of flashing lights, it was almost comical how many issues we had. After calling customer service and shipping it away we got it back without any error lights and random malfunctions. The settings do not stay at the settings we put them at. The ViewSonic PRO7827HD Home Theatre Projector maintains a high bar when it comes to display thanks to its superior color quality, sharp resolution, and fantastic 2,200-lumens. It is important to note that many of the cons we listed are most likely an anomaly and should not completely deter you from making this purchase if you are interested in it. This short-throw projector conserves space and works well for those who are trying to immerse themselves in an entertainment experience that reaches far beyond what massive monitors and wall-sized televisions can provide. If you are looking for an affordable gaming projector with an amazing display and a great throw ratio then the ViewSonic PRO7827HD Home Theatre Projector may be right for you with a little luck. The Sony VPLHW45ES Gaming Projector uses Advanced Reality Creation technology to show subtle details and textures. This crisp 1080p source is competitive with even 4K enhanced sources with its 1,800 lumens and high 60,000:1 contrast ratio. Motion-flow technology allows full detail even in scenes with rapid camera shifts and the super-fast response times eliminates all motion artifacts. This projector’s lamp can last up to 6,000 hours meaning you play on without stopping for repairs. A manual lens can zoom 1.6 times and has a wide lens shift range for greater flexibility of where you can setup your projector. Nine unique modes come pre-set with this projector to calibrate the display to gaming, cinema, and many other activities. Unique exhaust vents are positioned at the front of the projector to maximize throw distance and eliminate the worry about proper wall clearance along the back of the projector. The picture quality this projector provides is insanely beautiful and bright even though it only has an 1,800-lumen display which is far less than some of the other projectors on our list. The colors are uniform and suffers no rainbow effect whatsoever. On a plain white screen, the black levels of this projector are good and on a black screen they are absolutely perfect. We love how the unique fans are positioned to the front of the projector, this made it so much easier when we were setting up the projector on a shelf that had an enclosed back. The Reality Creation technology adds detail, crispness, and better motion handling to gaming even with graphics intense games. We love the position of these fans and they do an amazing job cooling the device down, but they are extraordinarily loud. 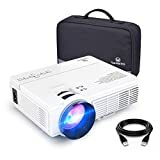 We looked online and the bulb replacements for this projector are super expensive so depending on how often and how long you use this projector that may be a big deal for you. Because this display is 1800-lumens it loses quality greatly especially when exposed to ambient light both natural and artificial. In fact, we think you need to darken the room to ensure your gaming performance is not hindered. This projector does not come with a built-in audio output, so you will have to use one of your HDMI inputs with a converter which is cheap but still annoying considering the high-ticket value of this item. There are also no keystone corrections, but this may be a good thing because it could decrease overall quality product if it was there. Overall the Sony VPLHW45ES is a very powerful projector that is great for gaming especially because of its Advanced Reality Creation technology to keep gaming buttery smooth. The motion flow technology prevents blurring, stuttering and other motion artifacts and the manual zoom lens gives you diverse ways to mount, stand, and move this projector. We loved the 3D transmitter because it is some of the best 3D imagery of the projectors we tried. The only difficulties we had with this projector are little issues here and there, so if you are looking for an amazing projector that does what you need and runs 3D gaming beautifully then the Sony VPLHW45ES may be the video projector for you. The Optoma HD142X Home Theater Projector has crisp 1920 x 1080p resolution and the supreme brightness of 3,000 lumens. The 23,000:1 contrast ratio and REC.709 color spaces enhances color and provides quality visuals when you are gaming even differentiating dark scenes. The lamp inside the projector has a long lifespan of up to 8.000 hours ensuring you can game for hours a day for a long time. This projector strives to make your entertainment experience all-encompassing with its 10-watt speaker that fills the room with crystal clear audio. The Optoma displays true 3D content from a variety of different sources and it supports a 144Hz refresh rate for smooth gaming with flicker-free images. We plugged our PS4 into the Optoma HD142X and were amazed, the picture is crisp and vibrant we feel like we should have paid a lot more for it than we did. The default color settings right out of the box were well balanced and sharp enough to look great for gaming and movies alike. This projector has keystone correction settings that are easily adjusted, and they don’t have any negative impact on performance. The 3D technology is some of the best we have tried out and it is surprisingly easy on the eyes. The 144Hz refresh rate is evident we tested it out with GTA, Witcher 3, and Oculus and were more than satisfied with the performance. There was relatively noticeable rainbowing effect with this display which may not even be enough to bother you unless you are picky and always looking for it like we are. Another issue we had was that there is no component input built into this projector, but we did know about that before our purchase and we did not realize how much we missed having one. When we were using a wireless input our game got shaky especially during scenes with very detailed and swift motions, it was less noticeable when we were playing first person shooter games that are normally shaky. Though the speaker was advertised to us as room filling and all encompassing, we found them to crackly, quiet, and they left us wanting way more. The throw ratio is not the best for anyone trying to get a large display with minimal space. The Optoma HD142X delivers seriously great performance for its low cost but there are some issues we had with it that made it less functional as the all-encompassing entertainment system that its advertised as being. It is very important to read all the product information before making this purchase since this projector needs to be further back to have the same size display that other projectors yield. While this wasn’t the best value projector we tried out it provides some serious quality for a great price, if that sounds like what you are looking for in a system them the Optoma HD142X is the gaming projector for you. The Acer Predator Gaming Projector is tailored to the gamer much like all Predator gaming products are. Not only does this projector come with a sleek red design that may match the other items in your gaming arsenal, but this display has native 1080p resolution. You can enjoy your favorite games on a display that ranges from 54-inches up to 300-inches with a high contrast ratio of 20,000:1. This 2,200-lumen DLP projector has vertical keystone correction and 1.1x optical zoom with 2x digital zoom and can provide superior gaming experiences for up to 6,000 hours without needing maintenance for the lightbulb. The Hidden Dongle technology enables effortless wireless streaming and it is amazing. There is no noticeable decrease in gaming smoothness when we were using the wireless connection to play online games. This gaming projector is a gaming beast and we loved that we had to put it just over 5-feet away from the display surface to get a screen size just over 100-inches. The Auto-Game Mode works well and automatically primes the display during your game to fend off stuttering, ghosting, and any other artifacts we have struggled with. This projector can adapt to “bright/dark,” environments to ensure visibility even if you are playing in a dark scene. Also, the slick red and black coloring that keeps with the rest of the Predator line’s design is attractive and if you happen to have other Predator gaming equipment you’ll want this projector desperately. This projector is anything but short when it comes to different connectivity options. The fans on this projector are super loud especially in comparison to most of the projectors we tried out. Just because the fans on this projector are loud does not mean they’re efficient, after several hours of intense gaming the projector is hot and though this didn’t impact functionality it is disconcerting. Though this projector can create 3D images we found it to be way harsher on the eyes than all the other projectors with 3D technology that we tried out. The speakers left us wanting more since they were a little quiet, but they are some of the best we have tried. Though we did not burn our lightbulb out until it died this product is listed as only having a bulb-life of 3,000 hours when in standard operating mode which just isn’t enough for marathon gaming on a massive scale. We heard someone call the Acer Predator Gaming Projector “gimmicky,” and we have never disagreed with a statement more in our lives. The Acer Predator Projector is one of the most legitimate gaming projectors we tried out with its automatic gaming mode that helps adjust the display to give the best gaming performance possible. While there were a vast variety of drawbacks we experienced with this gaming projector we will say that the positives outweighed the negatives, but it is important to educate yourself about some of the drawbacks before you make this hefty purchase especially important factors like battery life. The Acer Predator Gaming Projector was by far one of the best projectors we tried out for gaming and it may be the right projector purchase for you. The ViewSonic PJD7828HDL Home Theater Projector has a display up to 300-inches that is sure to thrill movie junkies and gamers alike. This full high definition gaming display has a crisp 1080p native resolution with the brightness of 3200 lumens. The ViewSonic uses exclusive Super-Color technology that offers a vast color gamut to produce gorgeous images in any environment. Two built in 10-watt speakers deliver enough sound to fill the room with the sounds of your gaming experience. This projector has a variety of connectivity options for speakers, mobile devices, computers and other electronics. Another feature that makes the ViewSonic Home Theatre better than its competitors is the eco-mode protecting the lamp for up to 10,000 hours. 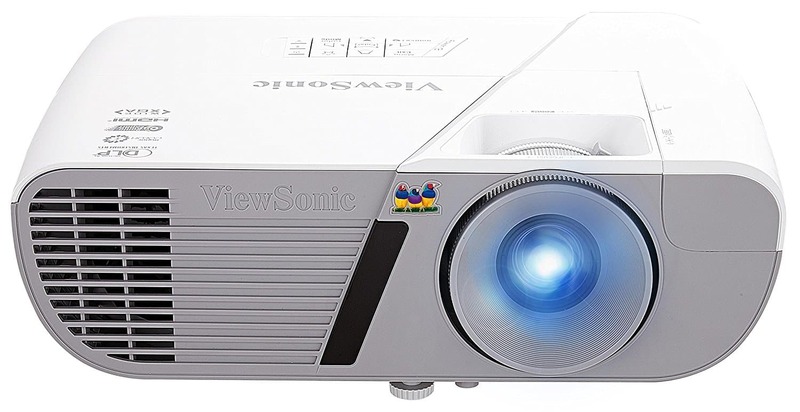 Should you need it the ViewSonic boasts one of the best warranties for a gaming projector with one year of protection of the lightbulb, and a three-year limited warranty on parts and labor. When this projector is completely scaled out there is minimal distortion on the screen and when you are gaming it is pretty much undetectable. The 3200-lumen screen is vibrant enough to provide us with an immersive gaming experience even when light was pouring in through one of our windows behind us. The projector is rich in adjustable lenses and legs for the best screen quality for your specific gaming or cinematic experience. The blacks are extraordinarily black, and we had no issues with rainbowing effects or anything similar. The rich color this projector brings to the table can almost compete with 4K display. We found the calibration settings of this projector to be very minimal when using HDMI connections, the most annoying part was not being able to modify the sharpness of this display because it would have made drastic improvements during gaming. After pausing our game and walking away for a little while the projector switched to standby mode, when we wanted to resume the game it took way longer for it to come out of standby mode then it should have. Booting this projector up takes a while, for a little longer than most projectors it will just sit on the logo screen before it becomes functional. This projector gets extraordinarily hot extraordinarily fast, while it doesn’t compromise the performance it is terrifyingly hot, and we think it could become an issue as the projector ages. The ViewSonic PJD7828HDL Home Theatre Projector is one of the most brilliantly colored displays that we got the chance to experience from a projector that did not have 4K enhancement. We would even go as far to say that this display was the second best on our list, unfortunately its quirks and setbacks kept the ViewSonic from claiming one of our top three spots. This projector has a shorter throw ratio than quite a few of the projectors we have tried out and it conserves space well making it functional in dorm rooms and tiny offices alike. We recommend this projector to anyone looking for phenomenal colors to enhance gaming and conserve space but you should be forewarned about some of the drawbacks that come with the ViewSonic PJD7828HDL Home Theatre Projector. The BenQ HT2150ST Gaming Projector has a full high definition display with native 1080p resolution for crisp imagery. This projector has 2,200 ANSI lumens at work to deliver a bright image that is balanced with beautiful color with a 15,000:1 contrast ratio and a six times RGBRGB color wheel for true to life colors to specifically enhance gaming. A short throw ratio of .69 and patented technology allows the BenQ to create a 100-inch display being set up only 5 feet from the display screen. This projector is specialized to have minimal input lag with specialized gaming modes to keep things running smoothly. Two 10-watt speakers with BenQ’s Master Audio technology adds brilliant and balanced sound to enhance the gaming experience. DLP Technology ensures image quality stays vibrant even as your gaming projector ages. The picture quality of this projector is immaculate especially when gaming in a dark room. The contrast ratio is fantastic, and the blacks are deep and dark, better than a few gaming monitors we have tried out. Even as you move the projector back to increase the display size the image stays relatively crisp. We experienced no noticeable input lag; all our input was quickly recognized by the game without any loss of synchronicity. Since this projector uses Digital Light Processing technology there is no issues with blurring, ghosting, or other motion artifacts that you would experience with the longer response times that some projectors have. Mounting this projector from the ceiling was the best way to set it up in our opinion because the legs on the bottom of the projector lacked functionality. The display loses considerable quality when exposed to light which decreases the immersive feel of your gaming experience, especially when your game is filled with darker scenes. If you are going to be gaming in a room with a moderate level of ambient light, then you will need to find a way to dim it because it will negatively impact your gaming performance if your vision is less than perfect. If you are using this projector by sitting it on a stand or desk it lacks severely in the adjustment department. The front leg is hard to adjust and doesn’t do great when you are trying to position it, we had to put a bunch of papers underneath it to adjust it the way we wanted. The focus ring on the projector is very touchy and occasionally letting appears blurry when you are bringing it into focus. The BenQ HT2150ST Projector is ideal for gaming and all forms of home entertainment. The BenQ can keep up with other projectors of similar price and delivers gaming performance with its Digital Light Processing technology. The DLP technology makes sure that graphic intense games with frequent camera shifts remain smooth, stutter-free, and does not display any other motion artifacts. If you are looking for a gaming projector that delivers ideal gaming and quality display, then the BenQ HT2150ST projector may be a great fit for you. So maybe you now know what you need from your gaming projector and you know what you want to do with it. If you have an idea about what you will be buying and the features that the item has then you might have other items, you are thinking about buying. 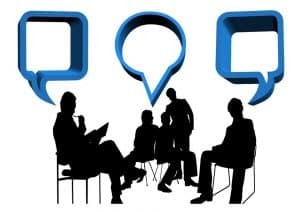 Before we start discussing the items that go along great with a new gaming projector we must remind you that each projector has different connections and compatibilities that will determine if an accessory will work with that specific projector. We have listed our favorite accessories we tried out below, but we encourage you do research about whether they will be compatible with the projector you ultimately purchase. If you find that the accessories below do not match your gaming projector, a quick internet browse of similar products will point you in the direction of anything you want. By reading below we hope to provide you with some idea that will make your new gaming projector purchase much more awesome. 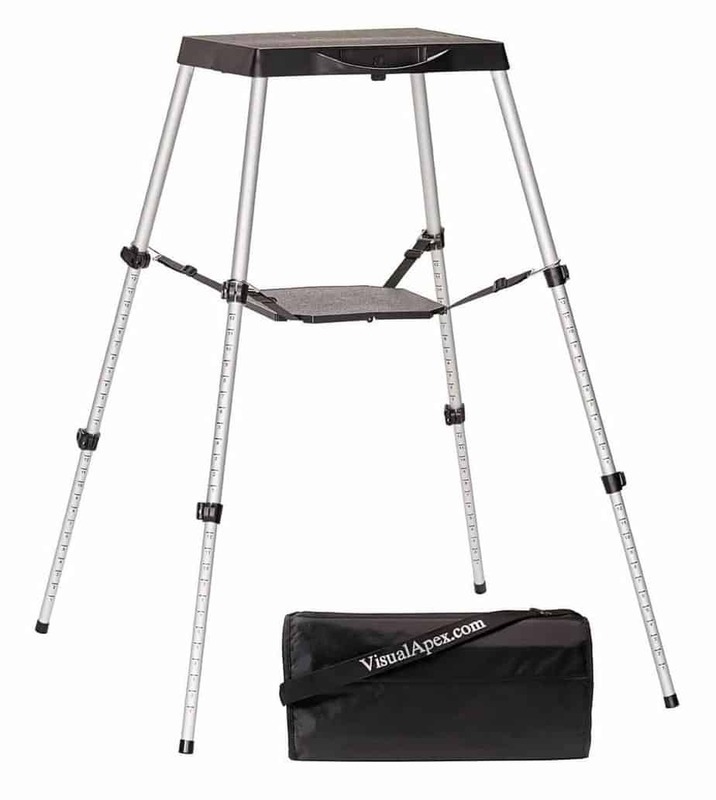 The Visual Apex Portable Projector Table Stand is a fantastically portable area to hold your new projector without taking up a large area of space. This stand is designed for portability since all of its pieces are compact enough to fit within the table top. A durable carrying bag with an extendable carrying strap is included with this purchase to carry your projector, stand, and additional accessories for maximum portability. The quick lock legs of this stand can adjust from 18.5-inches to 44-inches high and has easy to read labels for simple and precise height adjustments. While this stand weighs less than nine pounds it can hold up to 44-pounds without sacrificing sturdiness. All the tools you will need for assembly including the screw-tightening hex-wrench is included in this box to make assembly easy and quick, maximizing the time you can spend enjoying your projector. We love the stand because its compact carry doesn’t sacrifice any functionality whatsoever. We love that this projector stand includes an accessory shelf that is petite but handles enough weight to hold our speakers that make the projector that much more entertaining to use. While we couldn’t fit our speakers in the convenient carrying bag we fit everything else we needed into it. If you are clumsy you may want to invest in a different storage and carrying bag for your projector because this one doesn’t absorb shocks as well as the other case that made our list. We were genuinely surprised at how much weight this light little stand could handle and setup was easy so if you’re looking for a stand that can travel this is the only stand we think you should consider! The Elite Screens Yardmaster Indoor/Outdoor Projector Screen is lightweight and easy to carry and to take your gaming on the go. Setup is fast with its large folding frame, locking joints and Snap-On screen to minimize set-up time and maximize gaming time. Whether you keep the party inside or take it out onto the patio this 100-inch screen display is sure to please taking your games to a larger level. This screen includes a carrying bag, rigging cords, ground stakes, and support rings to secure your screen in place even on a windy night. This screen has a 150-degree viewing angle to allow amazing images no matter which way you look at it. Regular, Short, and Ultra-Short throw projectors can be used with this screen. We are huge fans of this screen because of how large the viewing angle is, it doesn’t matter if we were playing at a 45-degree angle from the screen the image was still quality. Setup of this screen was easy, and it was surprisingly sturdy even when we had it outside in gentle winds. The screen comes folded within the package but after we hung it for an hour prior to use the folds and wrinkles came out. 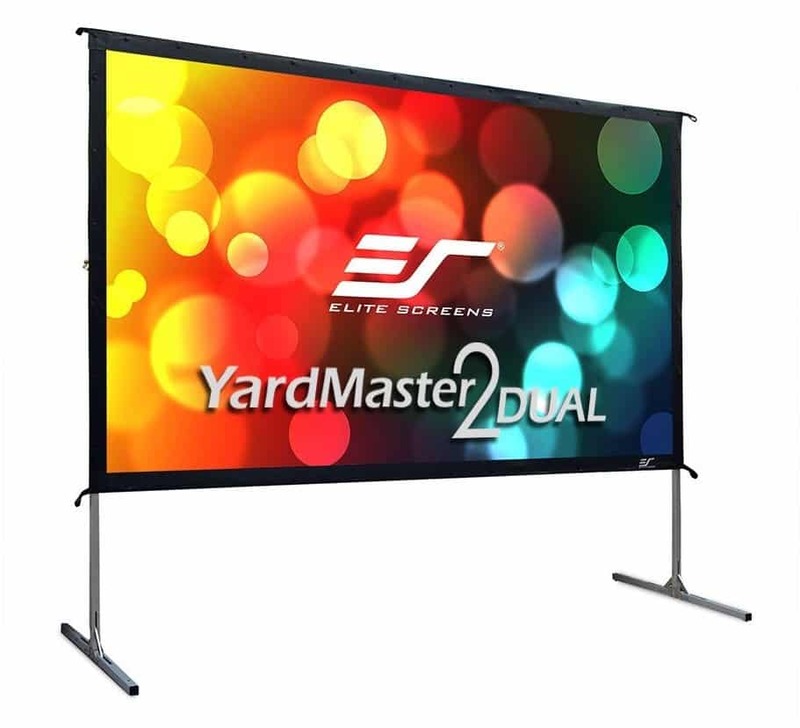 The first Elite Screens Yardmaster Indoor/Outdoor Projector Screen we received was missing part of what we needed to assemble it but when we called to get help the customer service was superior. If you are looking for a screen to use with your new projector then this is the screen for you. 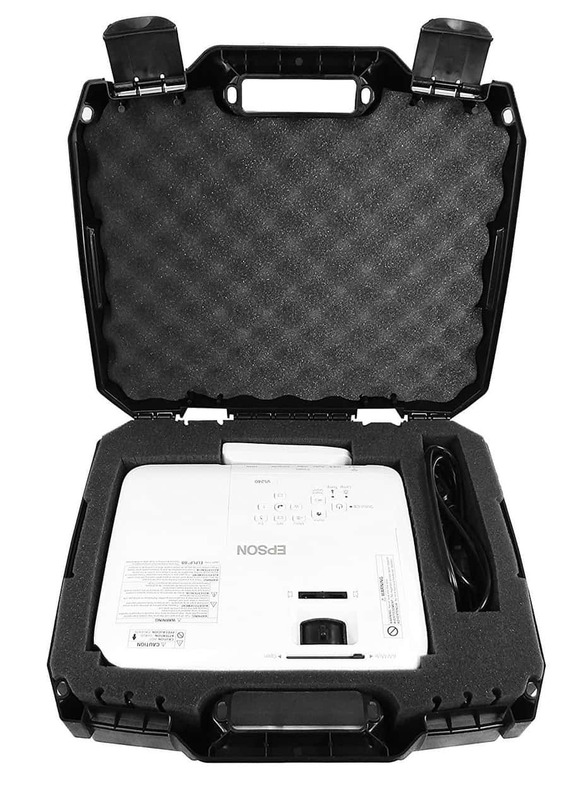 The WORKFORCE Safe N Secure Video Projector Hard Case is compatible with a variety of projectors making it easy to transport without concerns of damaging the sensitive equipment. This case can transport, and store select projectors and accessories while keeping them safe from dust, drops, and other forms of impact. The hard exterior is made of plastic and the interior is comprised of three customizable foam layers. The egg crate-like texture prevents narrow cables and skinnier projectors from slipping and sliding within the case even when it is jolted and jerked around. The largest dimensions your projector should be to use this case is 13.0” x 10.0” x 4.2” and can be used with a variety of different brand projectors. A secure double latch enclosure keeps your projector secure in its case even when accidental drops happen. Though we did have to remove some of the customizable foam to fit the cables we needed, our projector that matched the case dimensions sat snuggly within to case and didn’t shift when we dropped it several inches from the ground. The plastic wasn’t as thick as we initially expected but it was durable enough to withstand drops to the carpet, tile, and concrete throughout our building. The affordable price you pay for this case and the superior protection it provides makes it one of the best projector storage and transport cases we have tried. 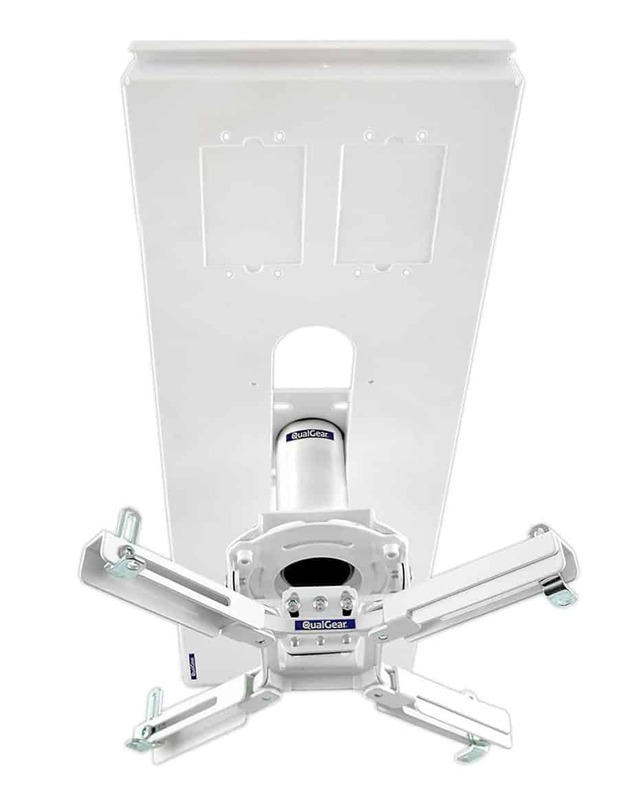 The QualGear Pro-AV QG-Kit Projector ceiling mount is an amazing alternative to the typical standing projector mount. This ceiling mount has a fantastic five-year warranty, but its superior quality almost ensures you will not need to use it. This ceiling mount can be used on many types of ceilings; vaulted, flat, drop, and truss ceilings are no trouble for this diverse ceiling mount available in two different colors. The pipe of this mount is available in lengths of 3-inches, 6-inches, 12-inches, 24-inches, and 36-inches. This ceiling mount has an internal cable management system to organize and protect your projector cords even as adjust its position. This projector mount adjusts on six different axes’, whether you choose to pitch, roll, or rotate you can rest assured that your projector can provide you with the perfect angle for your gaming experience. We found the dimensions of this mount a little confusing, you can attach a much larger projector than the size makes you think so that’s a plus. This mount was surprisingly easy to assemble and install, only taking us twenty-six minutes to put together and thirteen minutes to put up. The instructions are surprisingly easy to follow with nice illustrations, so anyone can follow along. We needed the drill to set up our mount in a room with cathedral ceiling but in the next office with a truss ceiling everything we needed was in the box. If you want a versatile ceiling mount for your gaming projector the QualGear Pro-AV QG-Kit Projector ceiling mount is the best one we have tried! 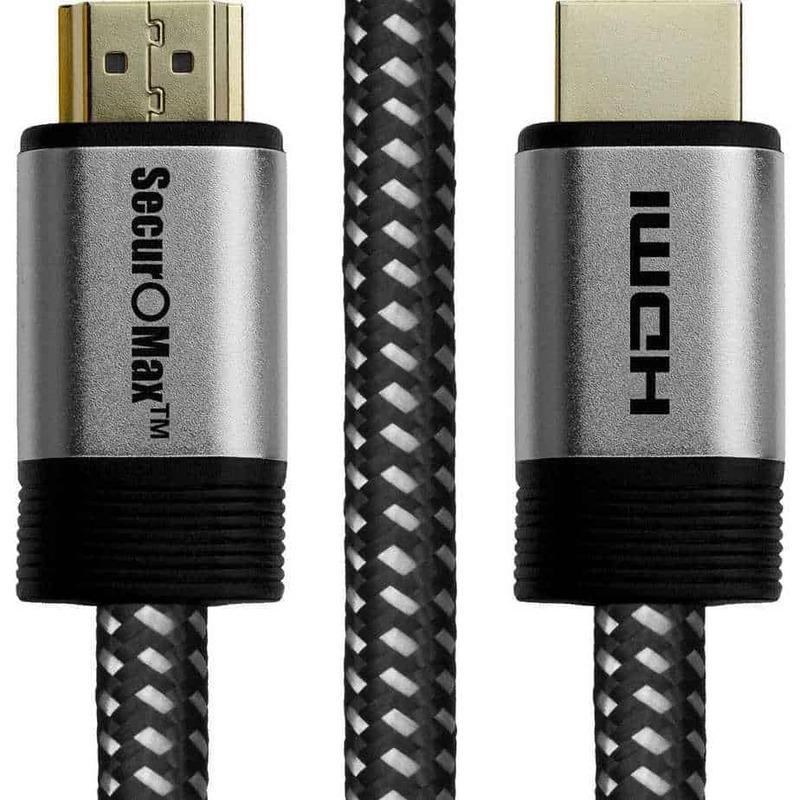 This ten-foot braided HDMI cable is long enough and strong enough to meet your connectivity needs especially if it must reach from counsel or monitor to your projector. This HDMI cable is compatible with any devices that have an HDMI port and supports numerous video resolutions. Whether it is 4K Ultra HD 2160P, 2K Full HD 1080P, 1K HD 720P, 3D format, or Quad HD video resolution this HDMI will deliver every display to your projector. The soldering points are coated with durable aluminum for shielding and low SNR. This flexible cable is braided in cotton to help it withstand the damage of repeated use, gaming, and spanning across high traffic areas. For being so affordable this HDMI cable is honestly the best one we have bought off of Amazon. The ten-foot cord is very thick compared to others but not to the point where it bends awkwardly or is too stiff to use like a few other reinforced HDMI cables we have used in the past. While the cotton did show external wear after about seven weeks of being used frequently we did not notice wear and tear to the actual cable or any decreases in performance. If you are needing an HDMI cord to use for connectivity between your gaming module and your new projector then this HDMI cord is ideal for you and with the low price you can buy multiple for each area in your house where you could use the additional connection. The throw ratio is calculated by the distance between the projector and the projection surface (D) over the width of the display (W). The throw ratio and throw distance are commonly confused when talking about projectors but we want to simplify the differences and give you a good example. Throw distance is the area from the tip of the projector lens to the screen. Throw ratios are important because they determine where the projector has to sit in relation from the projection surface. To make that less confusing, take a throw ratio of 4.0 as an example, you know that the distance is four feet away from lens to display per foot of display. If your display is 4 feet wide and the throw ratio is 4.0 then the throw distance is 16-feet. This ratio is important because it can help you determine how far your projector needs to be from the display to acquire a certain size display if it’s not listed anywhere on your projector in an understandable way. DLP stands for a digital light processor and creates superior contrast to other projectors, DLP projectors use small reflective surfaces to send light through a color wheel that rotates around. LCD stands for liquid crystal display and it delivers superior definition and color accuracy. LCD projectors shine lights through LCD panels that are one of three primary colors. In the past few years the differences in these technologies has gotten less extreme making the choice between the two a matter of personal preference. Without a doubt resolution will have a more impactful effect on the appearance of your games than the type of technology so for gaming it is a must to pay attention to that. We will restate this again but 1080p is a must for us when it comes to gaming but don’t panic if that’s above your budget you can make do with a different resolution as well. How Do I Change the Lightbulb of my Projector? The process of changing the projector lightbulb varies based on the type of projector you have but it is mostly a straightforward process with some patience and great instruction taking skills. Gather a microfiber cleaning cloth and a screwdriver. Turn off the projector at least an hour prior to replacing the bulb to avoid burns. You can remove the lamp door with your screw driver then gently remove the lamp assembly. Remember that microfiber cloth? You need to use it well ensuring to remove any dust that has fallen into the lamp compartment before you start the reassembly process. Insert your new lamp assembly ensuring that it is as clean as possible and is going into the projector the same way you took the last one out, putting it in backwards can cause damage to the projector and the brand-new lamp assembly you just bought. Now for the easy part. All you do to finish the repair process is replace the lid on the lamp compartment making sure it is facing the right way. While this next part isn’t part of the physical light bulb replacement process it is well worth mentioning especially because many projectors have this technology. Under your management settings, typically where you find eco-mode and other settings you will be able to modify the lamp timer. Also, pro-tip from people who spend way too long playing with projectors you might want to activate eco-mode to extend the lifetime of your lamp. Not only that but you can check power consumption under your general projector settings as well. While most projectors will come with cleaning instructions within the user manual we are going to give you a quick rundown of what you need to do to clean out your projector to keep it running at its peak performance. Before you clean your projector, you will have to unplug it for an hour before cleaning to ensure everything is cool enough to touch and remove any surface dust with a cloth you use on your laptop screen and phone. You can dampen the cloth ever so slightly to help remove grime but do not allow water to accumulate in vents doing so can cause damage, void your warranty, and cost big bucks to repair it. For cleaning the lens, you will need to apply lens cleaning solution to a cloth and wipe in a circular motion. You may need to use pressurized air to clean certain projectors but the specific information for your device should be referred to prior to cleaning. ​http://geni.us/8RWy​​​​http://geni.us/zuO7​​​The Epson Home Cinema 5040UBE is the best gaming entertainment projector that you won’t spend five figures on and it provides one of the most immersive gaming experiences we have ever had. This wireless full-high definition projector has 4K technology that enhances video even when the output itself is not 4K to show stunning intricacy. This projector has amazing power lens technology that comes with ten preset positions for motorized focus, 2.1 times zoom, and ultra-wide lens shift for easy adjusting even when you mount it from tall ceilings. The digital cinema mode boasts rich color with an expansive color palette. We love the quick response time that eliminates motion artifacts, lag, and stuttering. This projector is an entertainment marvel and is truly the gold standards for home projectors. The Optoma GT1080Darbee shocked us with its top pf line performance with an affordable cost sure to please any gamer and movie buff looking for an immersive experience. The short throw ratio makes the Optoma ideal for those who are trying to maximize screen dimensions while minimizing the amount of space between their projector and the display. The contrast ratio does not disappoint like others of similar price that occasionally lack depth or appear grayed out. The Optoma Darbee allows you plenty of wriggle room in the budget to use towards accessories and add-ons that are sure to maximize your gaming experience. While the Epson Home Cinema 5040UBE and the Optoma 1080Darbee have a lot of the similar features the Epson Home Cinema 20540UBE is the best quality for a gamer that is stays well below a five-figure price tag. The 4K capabilities that the Epson Home Cinema has sets it apart from the Optoma that has crisp full-high definition display that just can’t compete. The Epson Home does require more space than the Optoma Darbee so if that is the deciding factor you may opt for our mid-range competitor. If money and space were not a factor we would pick the Epson Home over the Optoma Darbee any day, but you will have to make your choice based on those factors. The BenQ DLP Video Projector is a flexible and diverse projector that is satisfactory for casual gaming, watching movies, and presenting information. While this projector is more heavily advertised for work we find that it betters for casual gaming and movie watching since smaller text appears blurry and far less crisp. This display is fantastically bright even in well-lit rooms thanks to its 3300-lumens allowing for a beautiful picture. 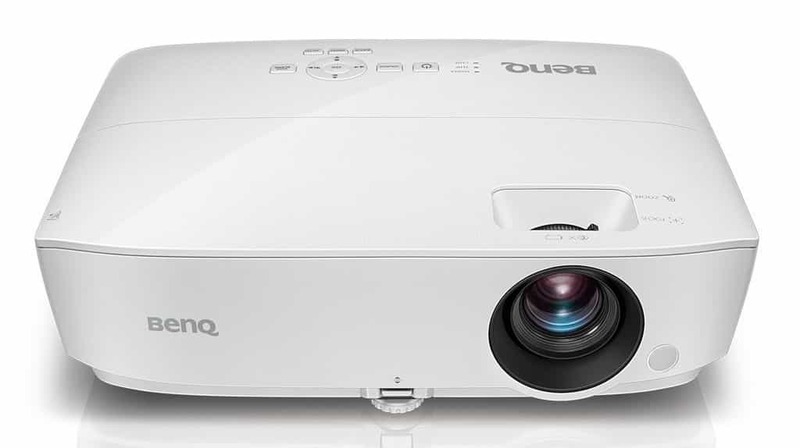 The BenQ DLP Projector is one of the most phenomenal projectors when it comes to having vast connectivity and a variety of outputs. Out of all the gaming projectors we tried out the BenQ gave the best performance with the most budget friendly price tag. Obviously, the Epson Home Cinema 5040UBE is a luxurious piece of entertainment equipment that can be used for work play and more play. We must give Epson major props for making such a phenomenal projector at the price others ask for far fewer features. It doesn’t matter if you are gaming in a well-lit room, your picture has the beauty and the crispness of a 1,000,000:1 contrast ratio with 4K display. You will not experience a better picture from any other projector on our list and your Epson Home Cinema gaming experience will completely immerse in anything you watch or play. 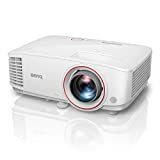 Unfortunately, the BenQ DLP Video Projector can’t perform on any level near the Epson Home Cinema Theatre projector however it performs the best for its price range. While the Epson Home Cinema has a 4K display the BenQ does not even have 1080p, but it still provides enough crispness and beauty to satisfy your gaming needs. Obviously, there is no comparison between the two projectors and we would pick the Epson Home Cinema over the BenQ projector anytime, but the BenQ delivers enough quality for lag-free games and crisp movies without costing anywhere close to four-figures. If you are deciding between the two budget is the factor that should have the most weight on your final purchase. All in all, the gaming projectors that have made our list are high-tech pieces of sophisticated gaming equipment that are sure to provide an immersive entertainment experience. Out of all the competitors our top pick the Epson Home Cinema 5040UBe is the best of the best because its 4K-display that provides detailed images and stutter-free game play for consistently smooth graphics. If you are shopping for a projector while being mindful of your budget, then our mid-range choice the Optoma Darbee provides the best gaming quality compared to the rest of the projectors of similar price. It has multiple modes that tailor its performance specifically to gamers, energy saving, and other activities setting it ahead of the competition. The BenQ MW526AE Video Projector cannot keep up with the quality of our first two choices but it provides the best game play and movie performance for a price far below the average for gaming projectors. 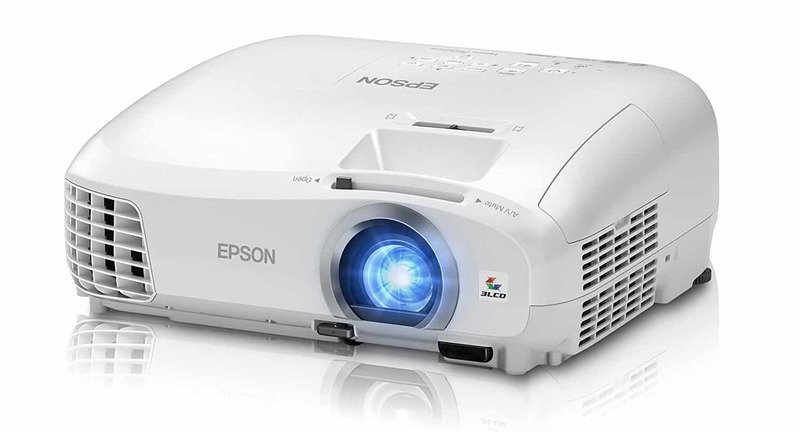 We know if you pick any projector on the list you will be satisfied but if you choose the Epson Home Cinema 5040Ube you will use it for years and wish you bought it sooner.